Playing an instrument is tons of fun and every one of us loves our instruments and we enjoy playing them. Whether we practice or just jam and improvise it is always a fun thing to do. What’s more important, while we have fun with our instruments, we also improve our skills, which is a very rewarding experience. Now, we all know that the key to a successful improvement is practice, practice, practice! But sometimes, practicing alone in your room is just not enough. Almost immediately as you start playing you will encounter other players and a good thing to do is to exchange experience and maybe sometimes play with your fellow musicians. Whether you play in a band or just jam with some friends, you will notice that the experience is completely different than playing alone in your room. First of all, it’s a lot more fun than playing alone. Trust me. Other than fun, it is also a great way to learn some new stuff and improve your skill and technique. Besides playing, this experience can additionally improve your communication skills and tolerance towards others which can only be useful in your everyday life. Now, let’s see what are some of the ways you can improve by playing with other people. Even if playing with a large group of people was never your intention, playing with a band is a good experience for every musician. It is a very good thing to know the basic division of a band. Learning how the band works will help you later when you try to learn the songs from your favorite popular bands and it will help you improve your knowledge of general music theory. Also, once you learn how to associate the rhythm guitar with drum and bass and lead guitar with vocals and melodic instrument it will be much easier for you to compose your music. Furthermore, whenever two guitar players that had an experience in playing with others try to play together, just two of them, one of them will provide the rhythm and the other one will play the melody. This will create much more beautiful sound to listen to. Every single member of the band is important! One thing you’ll learn if you play with other people is not to overplay and not to be arrogant. No one likes the arrogant and self-loving guitarists who think that they are the most important member of the group. Especially when it comes to jamming. You need to let everyone do their thing. This way you will learn to be patient and tolerant. And if you don’t learn these things and you overplay and think that you are the most important person there, others will let you know and it won’t be very pleasant. Yes, you can practice with a metronome. But sometimes you get carried away and you start improvising and you stop carrying about the tempo. This is something you can’t really do when you lay with other people because everyone is playing at a certain tempo and if you start changing it without warning, everything will sound completely wrong. No metronome can help you learn how to follow others like playing with other people can. Ah yes, improvising and soloing… who doesn’t like that? Of course, you can always program some drum beats and rhythm guitars and improvise over it. Today’s technology enables us to do whatever we want. But what happens when you want to change the key or tempo? If you stop your solo to change it on your computer program you will lose the heat of the moment. That’s why it is much better to play with a band. When you start shredding your solo your colleagues will almost certainly feel when to change the key or tempo. No computer program can follow you as good as your fellow musicians. Sometimes when you compose your music you get stuck. It happens to all of us. This is nothing strange but it can be quite frustrating and sometimes you can’t get over that one part for weeks. When you create your music with your band mates, there is always someone who can throw in some ideas and help you with the song. 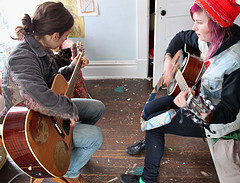 The songs are composed much faster if you have the help of your friends and you can always learn some new tricks or techniques in the process. This article was contributed by Raphael Taylor of MusicSkanner.